A powerful and efficient meat slicer is a great addition to any kitchen. You can get perfect cuts of meat, vegetables, fruit, and even cheese, with the thinnest slices just like you would find in your local deli. The best meat slicers are versatile, allowing you to prepare a range of different food, whether you are slicing cold ham, or preparing thin slices of premium steak for fast grilling or frying. If you want a meat slicer but aren’t sure where to start, then you are not alone. There are countless models on the market, some which are worth your investment, and others that leave a lot to be desired. Finding out which is right for you will be much easier when you have a list of the very best meat slicers available to buy today. The following options meet our high standards for quality, ease of use, and durability. If you want to make a real investment that will improve your kitchen, then this is the best place to start. When looking for the best meat slicers you might assume that the price would be high. With the Elite Gourmet EMT-503B, this is not the case at all. It’s an affordable meat slicer that comes in at less than $50, while providing features that you would expect on more expensive models. The first thing to note is the construction. Like more expensive models, the main housing is made from cast aluminum that provides stability while keeping the weight low. There are plastic parts used, admittedly more than on other units, but all the essential moving parts are made from quality steel or aluminum. Although there are compromises in material construction there are no compromises in overall quality. 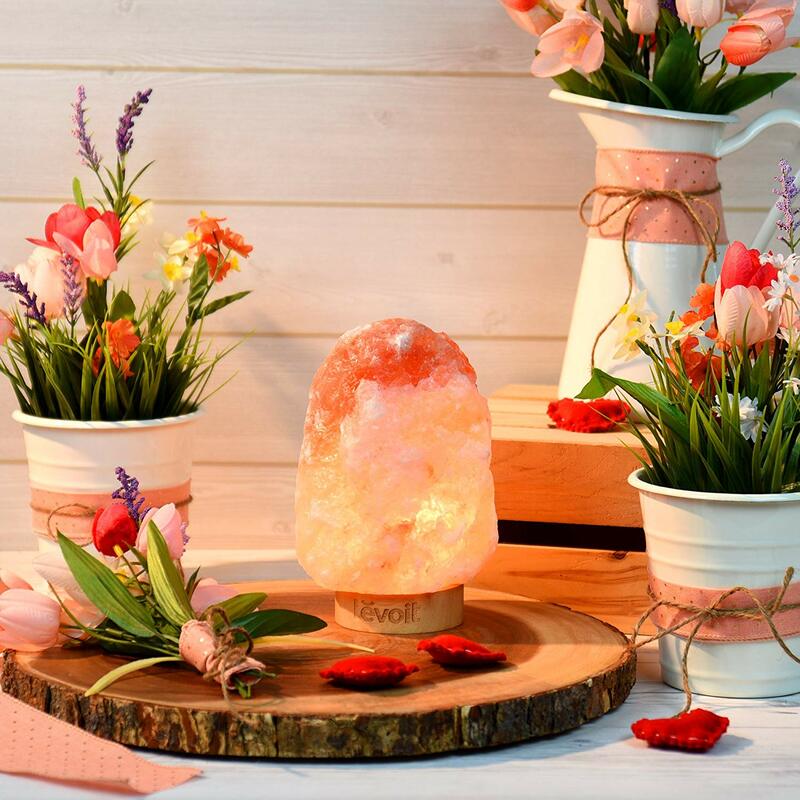 It is well put-together and feels solid enough that it could be used for years without breaking down. The stainless steel 7.5” blade is removable for easy cleaning, and it spins at high RPM thanks to a 130-Watt motor. You’ll breeze through steak, tougher cuts of beef, pork, sausages, ham, and anything else that you want to slice in your kitchen. 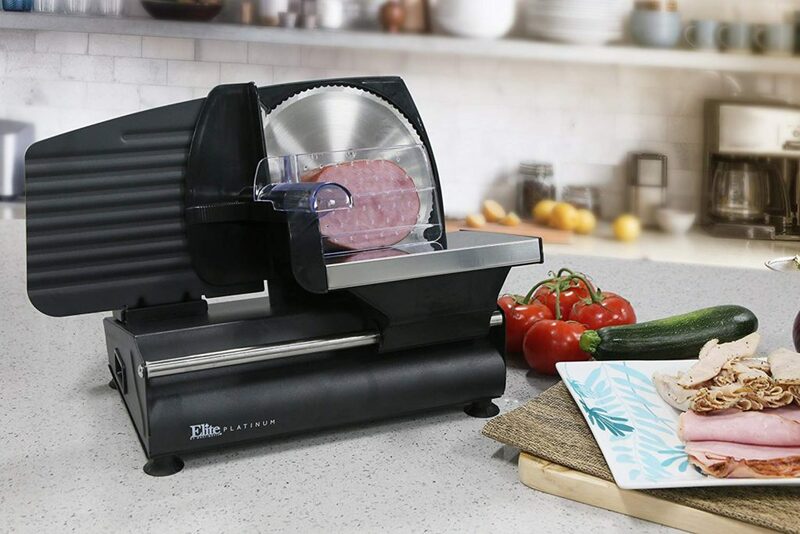 Presented in an attractive black finish, this is the perfect entry-level slicer and one of the best meat slicers for the budget-minded shopper. 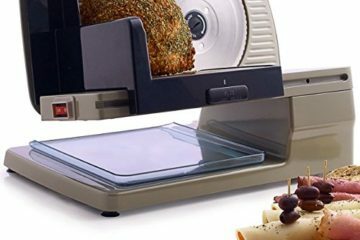 Cusinart is well known as a producer of quality kitchen appliances, and the FS-75 Kitchen Pro Food Slicer is exactly what you would expect from the brand. Quality materials are used, the design is appealing and modern, and the performance is good enough for home cooking. Steel and aluminum are used in the construction along with some plastic parts. The blade is 7.5” and made from hardened stainless steel, with a serrated blade ensuring that it won’t require sharpening even after hundreds of slicing sessions. 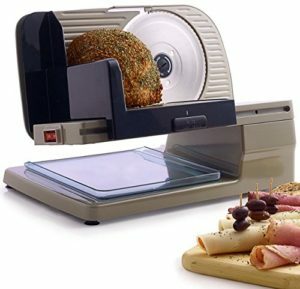 This is the slicer for you if you want something that is attractive with a design similar to your other modern appliances. It’s not all style, because it can cut with some of the best meat slicers in the budget range. You’ll get through all your standard and specialty meats, with plenty of power for large cuts, vegetables, and fruit. 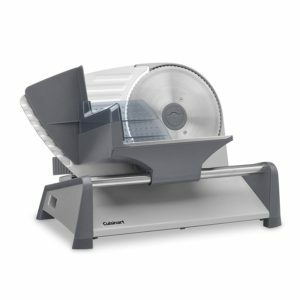 This slicer is often offered for a discounted price, which makes it a great bargain if you purchase at the right time. Step up a little in price and you could be the new owner of the Nesco FS-250 180-Watt Food Slicer. This is one of the best meat slicers available to buy for under $100, offering excellent cutting ability, a larger than average 8.7” stainless steel blade, and construction that is almost entirely of steel and aluminum. While plastic is used on some parts of the housing, this is only for non-essential cosmetic parts that won’t break down after extended use. 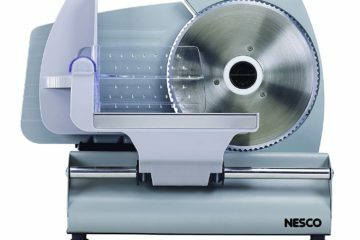 Nesco is one of the top brands for affordable slicers, and it’s easy to understand why. Cutting is efficient and powerful, allowing for effortless slices on virtually every ingredient. You can slice firm cheese, harder breads like flatbread, focaccia, and baguettes, and you will be able to work with any kind of boneless meat that is pre-cooked or raw. It’s perfect for cured meats, smoked meats, and specialty deli meats, and the sharp blade allows for wafer thin cuts that simply wouldn’t be possible with a kitchen knife. 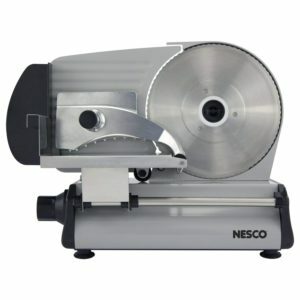 For under $100 you can have one of the best meat slicers available today, making the Nesco FS-250 one of the most compelling options on this list. 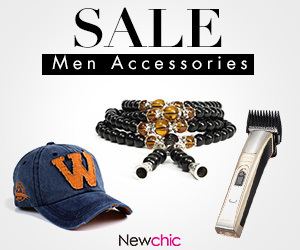 The unit is made from stainless steel, which is unusual in this price range. If you want an alternative to the Nesco and Elite Gourmet models, you could consider the Stainless-Steel Electric Food and Meat Slicer from Valley Sportsman. This is a no-frills slicer with a basic design, but it provides excellent cutting capabilities that would make it perfect for a kitchen where you simply want the best possible tool without worrying about the looks. Stainless steel is a more premium material when compared to aluminum, and this could help the unit to last much longer in your home. 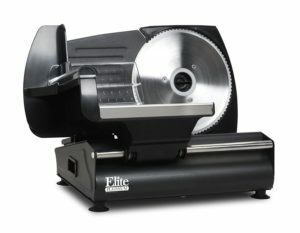 If you expect to use a slicer more than once per week then the durability of this model will be appealing. It’s not particularly good looking, but it performs where it counts. If you don’t need something that looks fancy, then the premium construction of the Valley Sportsman slicer will appeal, and it comes in at a great price which makes it an easy decision to make. 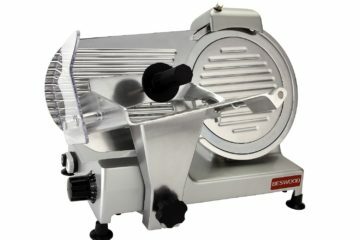 The Chef’s Choice 615 Food Slicer combines high performance with excellent quality materials and an easy to use design. One of the best meat slicers on the market today, the Chef’s Choice 615 Food Slicer combines high performance with excellent quality materials and an easy to use design. The only downside of this slicer is that the styling is outdated. If aesthetic is not important to you, then you’ll want to take a closer look. This slicer features a 7” blade, aluminum chassis construction, steel parts for all the essentials, and a few plastic parts on the food tray and serving tray. The fact that this slicer comes with a serving tray makes it unique on this list, and that’s one addition that would be appreciated by a significant group of consumers. In terms of cutting capability it can compare with slicers that are twice the price, which is one of the reasons that it has some of the highest consumer reviews out of any slicer on the market today. 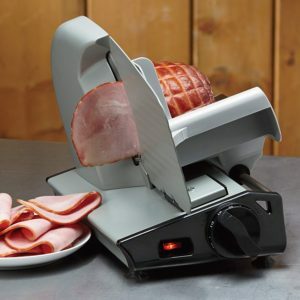 Cut specialty deli meats, smoked sausages, salami and pepperoni, ham, steak, pork, vegetables, cheese, or anything else that you would typically put on a meat slicer – this model can do it all. If you demand quality, then this model won’t disappoint. It remains affordable for most households and would be a great investment that would last for many years. Online purchasing has made it easier than ever before to get the highest quality meat slicers for your home. The best meat slicers aren’t necessarily the most expensive, and you can get excellent quality options even on a budget. With any of the options on this list you will enjoy quality cuts on your favorite ingredients, making your kitchen more convenient and versatile for any style of meal.